This tour has been strategically planned to coincide with the beginning of the grape harvest in the Southern Hemisphere. Few wineries allow guests during this period, however, Wine-Knows has been very fortunate to secure appointments at several world-class producers. There will be “insider” opportunities to see exciting harvest activities…from the careful selection of grapes in the vineyard to the various stages involved in birthing a wine. 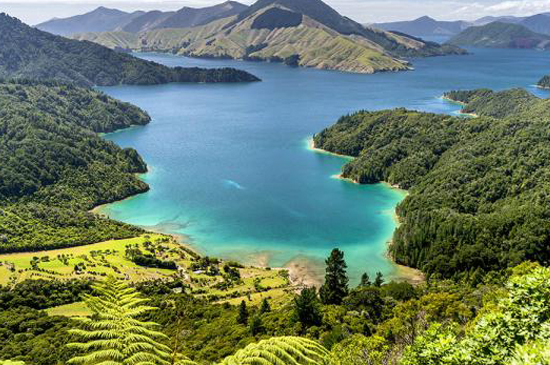 It’s an absolutely magical time to visit New Zealand. Morning: FREE to accommodate arrival of flights and to adjust to jet-lag. Afternoon: The trip begins in the famous Hawkes Bay wine district on the west coast of the North Island. (The charming town of Napier is easily reached by air from Auckland in an hour.) Likened to a little piece of the Mediterranean Riviera “down under,” Napier is often referred to as the Nice of the Pacific…a perfect spot to recuperate from an international flight. 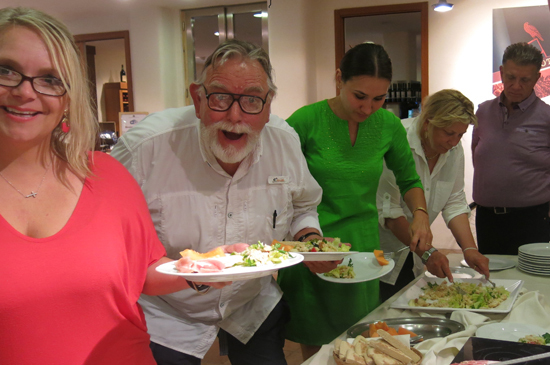 We’ll kick the trip off with an introductory seminar on the region’s wines and foods. Evening: Our inaugural dinner will be at one of the city’s best restaurant which features a cornucopia of New Zealand’s fish and seafood, as well as an exceptional wine list. Our 5 star hotel is one of the town’s many Art Deco gems. Morning: Napier is an architectural jewel. Largely destroyed by an earthquake in the 1930’s, the city was rebuilt in the grandeur of the then popular Art-Deco style. Today we’ll have a guided walking tour of the city’s most impressive buildings led by a local architectural buff. Afternoon: There’s no better way to begin the trip than to start at one of Hawks Bay’s most renowned wineries. Regardless of wine critic, they all rave about this winery. 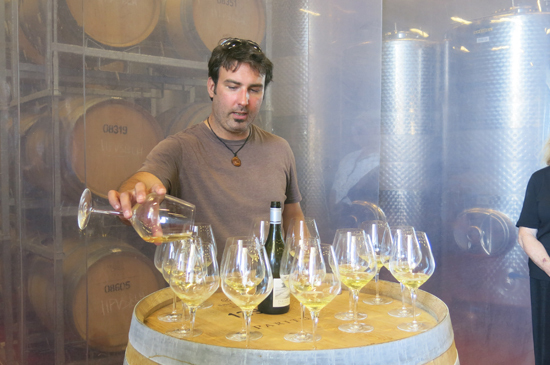 Especially known for its Bordeaux blends and Syrahs, this rock-star winery also produces stunning Chardonnay. Evening: Dinner tonight will be at a winery. If the stupendous setting doesn’t take your breath away then dinner in their “destination” restaurant surely will. Private tasting and tour before dinner. Afternoon: Next, we’ll travel to the “Gimlett Gravels” sub-region of Hawkes Bay which boasts gravel-like soil similar to that of Bordeaux and Chateauneuf du Papes. Two of the area’s mover-and-shaker wineries will receive us for private tastings and a tour of the vineyards during harvest. 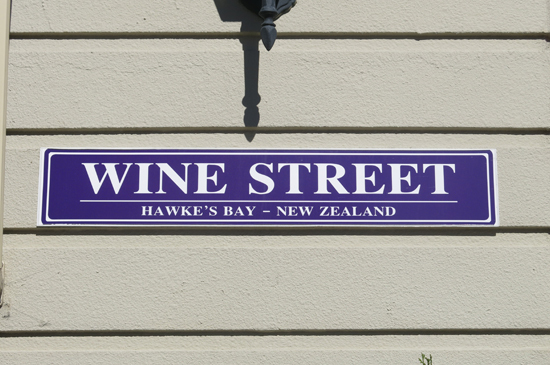 Evening: We’ll end the day with dinner in the home of one of our favorite Kiwi wine producers. 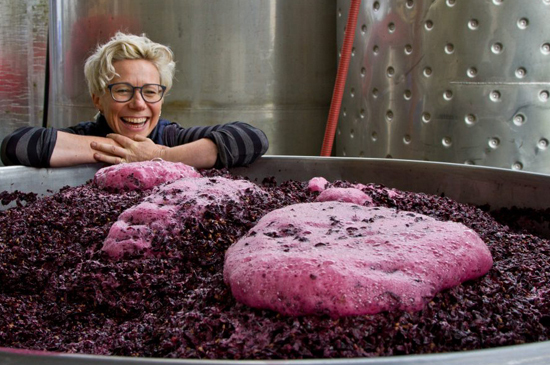 Morning: Bid your farewell to Hawke’s Bay as we’ll travel to the bottom of the North Island to the Martinborough wine district, home of the country’s finest Pinots. Afternoon: We’ll stop enroute at a premier winery that produces outstanding Pinots. Our home for the next few nights will be the quintessential village of Martinborough which is surrounded by vineyards or sheep farms in every direction. 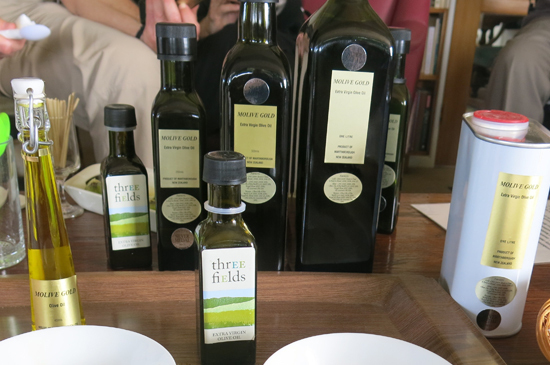 Afternoon: Today we’ll visit an award-winning olive oil producer. Then, a private tasting at one of Martinborough’s iconic wineries. Evening: A private dinner will be held in one of the finest wineries in the region. 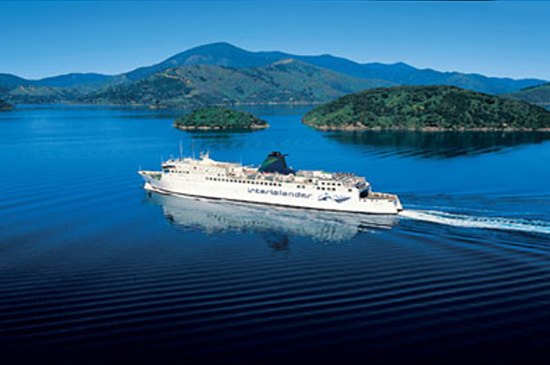 Morning: All aboard, as today we’ll journey to New Zealand’s southern island. Evening: A private dinner will be held in a gorgeous winery. Their excellent wines may be familiar to some as this producer has a loyal following of Americans in-the-know. 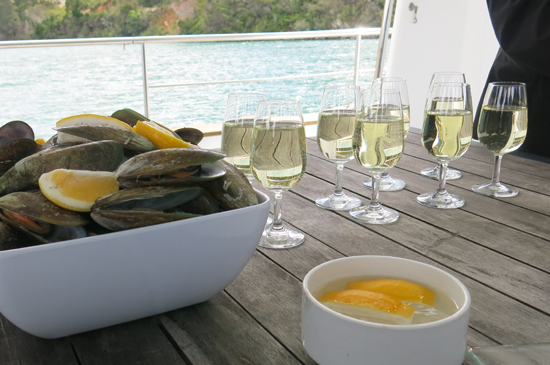 Morning: Today is leap day and you’ll be leaping for joy on a private boat cruise to a mussel farm in the ocean. While Zealand is famous for wine and sensational scenery, it’s also home to the largest mussel on earth. This variety is also one of the most succulent. Because of its growing global popularity, these mussels are one of the fastest expanding industries in New Zealand. Lunch will be mussels cooked in Sauv Blanc! Afternoon: Next, a private tasting at a winery with a fabulous view…but it’s the killer Sauv Blancs that will steal the show. Evening: Free…dinner on your own. Afternoon: Today will be our last opportunity to soak up the wines of Marlborough and we have a star-studded lineup. Both boutique producers are sure to impress. Evening: We’ll dine tonight at a private dinner with a winemaker who is known for crafting superb quality wines, and his caterer for creating a fab dinner. Morning: Today we’ll fly further south to Queenstown. Fit for a Queen, we’ve saved the most dramatic scenery for our last stop. Afternoon: Lunch will be at a small producer making big wines. Next, a tasting with the winemaker at another boutique winery making stellar wines. Evening: A special welcome dinner will be held at one of the region’s top-notch wineries. 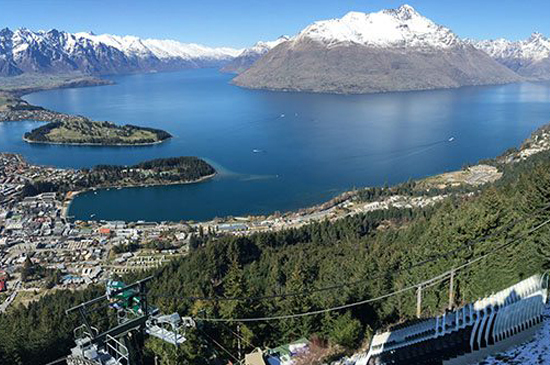 Queenstown offers everything from extreme sports to bungee-jumping (this is the area where the sport first began), hiking, sailing, and shopping. Or for those wanting to relax, there’s chilling-out at the hotel’s pool, or one of the city’s many a sidewalk cafés. Evening: Dinner is also free, although there will be an option for a pot-luck group dinner …all rooms at our 5 star property come equipped with a full kitchen. Morning: Today we’ll visit our last wine district located just outside Queenstown. An historical piece of the South Island’s history, this area was a noted gold-mining center in the late 1800’s. Today, it’s known for its liquid gold— in the form of cool-weather varietals such as Chardonnay, Pinot Gris and Pinot Noir. Afternoon: Visits to producers ranging from mom and pop to mega-dollar wineries. Evening: Farewell dinner at one of the town’s most highly respected restaurants. The trip ends after breakfast. (Frequent flights to Auckland are available for connecting international return flights). Should you wish to stay on extra day’s in this special city, Wine-Knows can arrange for additional lodging. The tour begins on the afternoon of February 23, 2020 in the city of Napier (located 1 hr by frequent air service from Auckland). 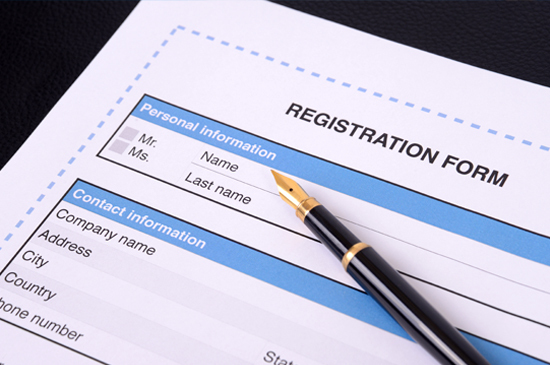 It is strongly advised that participants arrive in New Zealand the day before to avoid any possibility of missed air connections. 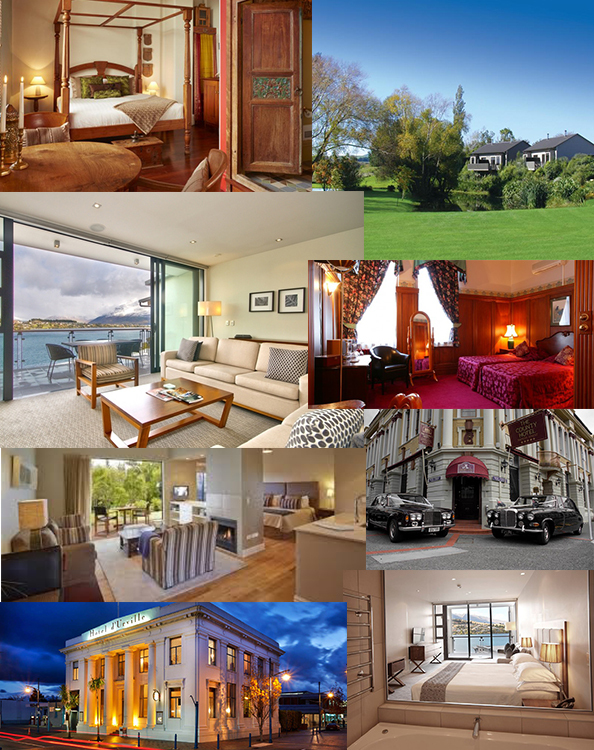 We will be happy to obtain early arrival hotel space for you in Napier or Auckland. What about airfare to and from New Zealand? Hotels are a combination of 5 & 4 star properties, as well as historic & modern. Each one offers the best of what the area has to offer. Boutique 5 star hotel built in the Victorian-Edwardian style. Once an impressive office building, this architectural gem was one of the few buildings in Napier to survive the devastating 1931 earthquake. Transformed into the town’s finest hotel, its bedrooms offer all comforts of the 21st century. 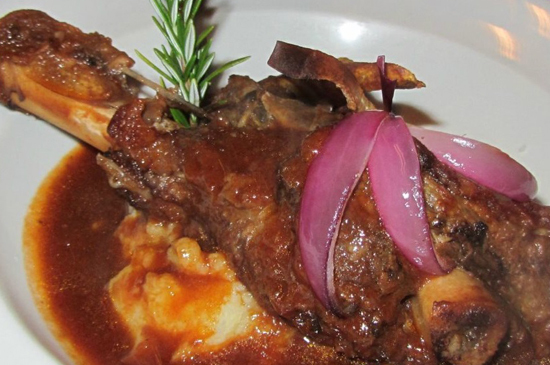 An award-winning restaurant completes this luxurious package. Modern 5 star lakefront property with breathtaking panoramas. This super stylish hotel boasts well-outfitted contemporary style apartments with marble bathrooms, along with a spacious front room. There is an on-site spa & gymnasium, as well as a “wine lounge” featuring the finest of New Zealand, along with the 1st growths of Bordeaux. Landmark 4 star property featured in 1000 Places to See Before You Die. This building was formerly the city’s prestigious central bank. Built in the art-deco style, the impressive structure has cleverly been converted into a boutique 10 room hotel. 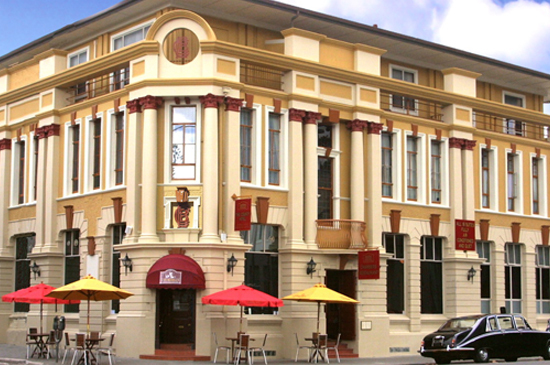 The bank’s former first floor is now the lobby & restaurant. Up-stair offices are now individually decorated bedrooms. Bucolic 4 star wine country estate of cottages set amongst the vineyards. These modern cottages, each one individually designed with artwork & furnishings by New Zealand designers, offer plenty of space to relax. 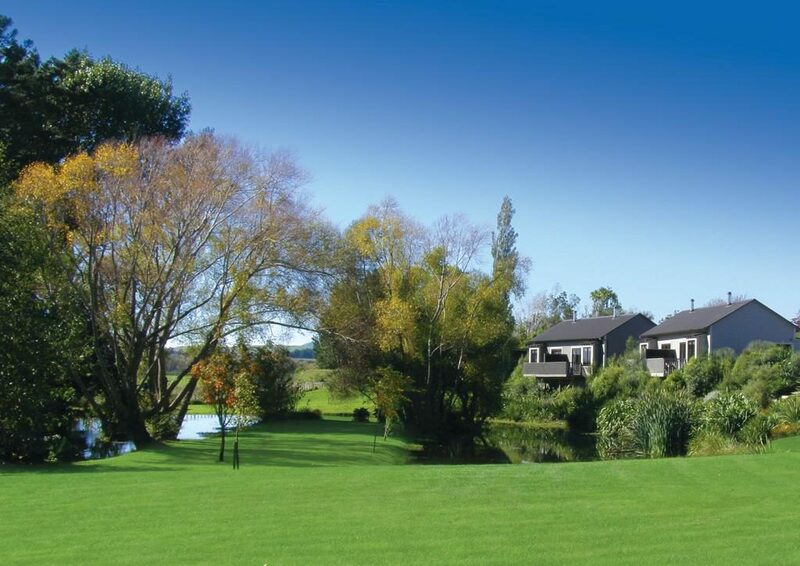 The resort is built on a private lake just outside a historic wine village. A pool, as well as beautiful gardens complete the idyllic package. Dining experiences have been mindfully selected. Meals will be special culinary events ranging from sophisticated world-class restaurants, to simpler family owned places or wine bars. Private winemaker dinners will also be featured. In addition to carefully chosen restaurants, this tour will feature foodie excursions such as a visit to an olive oil producer and a mussel farm. The tour will be casual dress during the day. Men should bring a sport coat (tie optional) for dining at the more sophisticated restaurants. Women should bring a similar level of attire for the more formal dinners. Don’t forget to bring a swimsuit as some of our hotels have pools. Daytime Fall temperatures in the Southern hemisphere can vary from 65-80 degrees so pack accordingly. While rain is unusual at this time of year, it never hurts to pack a small umbrella. The price is based upon double occupancy. Should you wish to share a room, every attempt will be made to find you a roommate (most of the time we have been quite successful in doing so, however if we are unable to find you a roommate, you will need to pay the single supplement of $1200 US. clients do! This is your trip—if you would rather sleep in, shop, or simply chill at a sidewalk café, then do it! 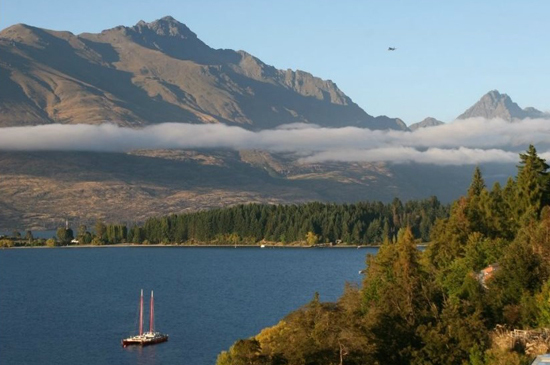 The tour ends in Queenstown on the south island. Queenstown airports offers frequent flights to Auckland where connections can be made for international departures. A Deposit of $1,500.00 US is due at the time of booking. A second installment payment of $1200.00 US is due by February 1, 2019. The third installment of $1,000 is due by July 1, 2019. The final payment is due by December 1, 2019. There will be a $100.00 US charge for late payments. Make all checks payable toWine Knows Travel, Inc. Trust Account. A non refundable fee of $250.00 US, applies for all cancellations. Cancellations received prior to September 1, 2018 will be fully refunded less the cancellation fee. A 75% refund of the remaining funds will be made to those who cancel between September 2, 2018 and January 1, 2019. A 55 % refund of the remaining funds will be made to those who cancel between January 2, and July 1, 2019. A 25% refund of the remaining funds, if any, will be made to those who cancel between July 2 and December 1, 2019. There are no refunds for cancellations after December 1, 2019. Trip cancellation insurance is strongly recommended and can be purchased for a nominal premium. Cancellation date is determined by the date notice of cancellation is received by Wine Knows Travel Inc. at the place of notice below.